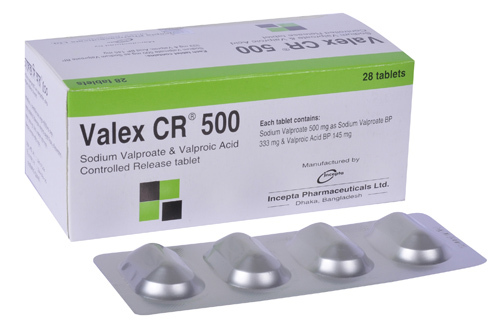 Valex CR 200 tablet: Each enteric coated controlled release tablet contains Sodium Valproate BP 133.2 mg & Valproic acid BP 58 mg equivalent to Sodium Valproate 200 mg.
Valex CR 300 tablet: Each enteric coated controlled release tablet contains Sodium Valproate BP 199.8 mg & Valproic acid BP 87 mg equivalent to Sodium Valproate 300 mg.
Valex CR 500 tablet: Each enteric coated controlled release tablet contains Sodium Valproate BP 333 mg & Valproic acid BP 145 mg equivalent to Sodium Valproate 500 mg.
Epilepsy: Adults -Initially 600 mg daily given in 2 divided doses, preferably after food, increasing by 200 mg/day at 3-day intervals to a maximum of 2.5 g daily in divided doses until control of seizure is achieved. Usual maintenance dose is 1-2 g daily (20-30 mg/kg daily). 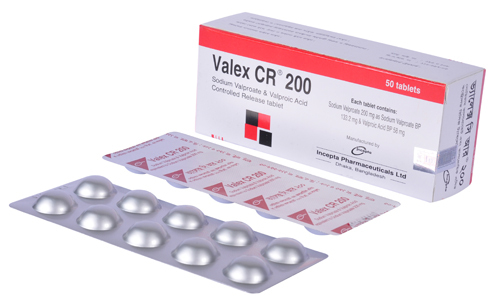 Febrile convulsion20-30 mg/kg/day in 3 divided doses. 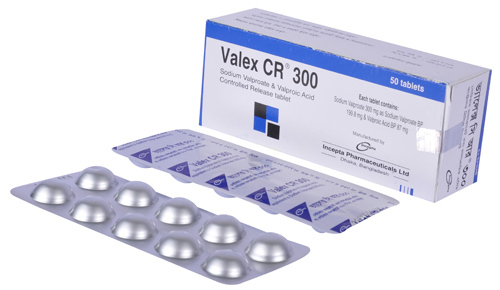 Bipolar disorder initially 20-30 mg/kg/day in 2-3 divided doses; adjust dosage in 3-5 days. Maintenance dosage is 1000-2000 mg/day.Prophylaxis of migraine 300 mg twice daily, although some may require 1000 mg daily.